They might not be who you think of when you picture philanthropists. Or arm wrestlers. There’s a chemist, a social worker, two librarians, a copyeditor, a nonprofit worker, a few teachers, more than one city employee, an insurance wholesaler, several single moms and two furniture manufacturer employees. 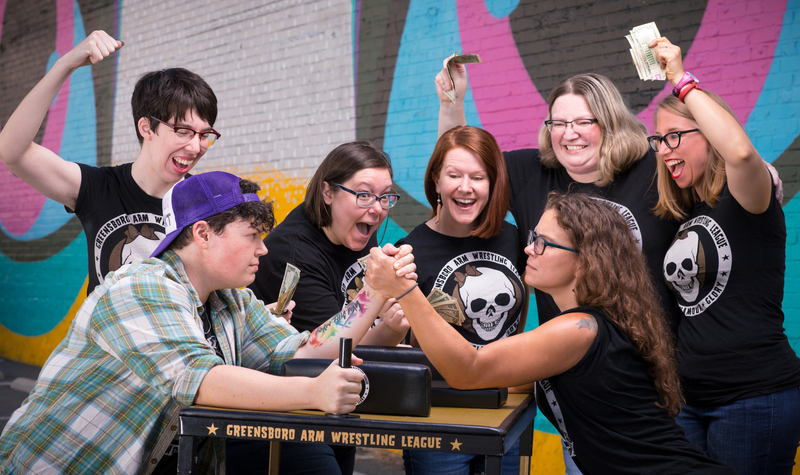 They’re just some of the ladies of the Greensboro Arm Wrestling League (or GRAWL), an all-volunteer group that throws ladies-only arm wrestling tournaments to raise money for local nonprofits. Since its inception, GRAWL has raised more than $15,000 for Greensboro nonprofits, especially those that serve women and girls. Three times a year, local women don crazy outfits and bare their biceps for a cause. The group was founded in 2016 by Rachel Scott, an academic coach for a middle school and the co-owner of Geeksboro Coffee and Beverage Company, Meagan Albert, a social worker, and Amanda Lehmert Killian, a city employee. It’s one of dozens of league like it across the country. 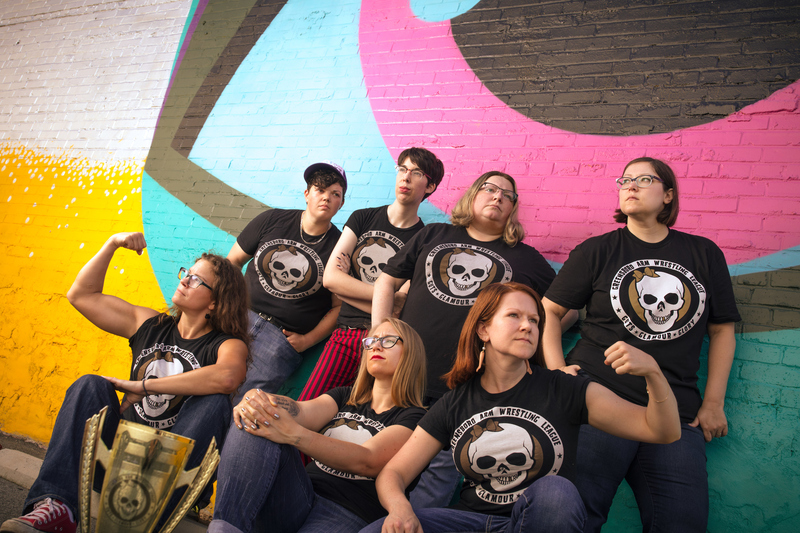 “I saw the potential to borrow from this concept as a way to help local charities, being that Greensboro was a city of amazing women and feminists who could support something as cool and bold as ladies’ arm wrestling,” Scott says. GRAWL events – or GRAWL brawls – aren’t like any fundraiser you’ve ever attended. They are high-energy, fast-paced tournaments with elements of cosplay and fantasy reminiscent of professional wrestling. Only in this case, the wrestling is all real. GRAWL’s pro-women, supportive environment has a way of making introverts and the anxiety prone demolish their personal comfort zones. Each woman comes up with her own stage persona and crafts her own outfit. Many choose to be powerful and glamorous. The lady wrestlers may be the center of the GRAWL universe, but the group’s work would not be possible without many other volunteers of all genders – 70 in all just this season – and talented professionals who have donated their time. Emcee Matthew Cravey, referee Shane Umbarger, and Lee Budkey, aka DJ 87, are at the center of every show. Photographer Becky VanderVeen helps the women transform into their stage personas from behind her camera. She also captures all the action at the events, helping the league promote what it does. Thanks to these volunteers, and Geeksboro donating its space for free, 100 percent of ticket sales and online fundraising for every brawl goes directly to the nonprofit. “All GRAWL volunteers and wrestlers have become like a family of weird, introverted-but-also-extroverted folks who have similar passions revolving around glitter, hot glue guns, and inclusivity,” Rachel says. Want to check out GRAWL? The next event is GRAWL-o-ween, a Halloween brawl to benefit the Greensboro Mural Project, at 8 pm this Saturday, at Geeksboro. Tickets at $6 at the door. Or donate online now.